I’ll admit it. 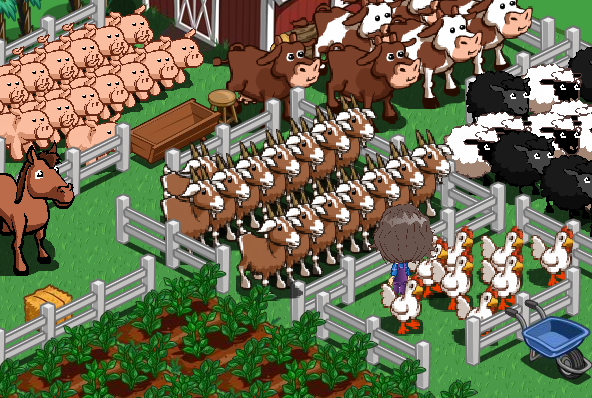 I play “that farm game” (technically, Farmville, created by the social media gaming leader Zynga) on Facebook. One day my sister was suddenly into it because her co-worker sent her an invite. I refused. My sister’s friend then got into it and said it was “just so fun” – mostly because it was real-time lapsing and you could live your life “on the farm” and “in real life” simultaneously (more to say on that in another blog posting). Fine. And, here I am today. I have a massive farm which I need to spend 20 minutes a day tending to. I usually go “check on the farm” like the farm addict that I am around 7:30 am after I’ve done a first pass at my email inbox. Zynga does a great job of keeping users engaged – from encouraging gamers to send free gifts to each other every time you log on, to being able to quickly and easily visit your connected friends’ farms and help out, to introducing new features in a drip fashion almost weekly. Yes, my friends, that is a pixelated chicken. An eyesore. Please Zynga, remove that last zoom so my chicken will look as it should. And for any features you choose to implement in the future, please make sure that quality is not compromised as a result of it.